THIS... this is why I self-publish. And why you should, too. 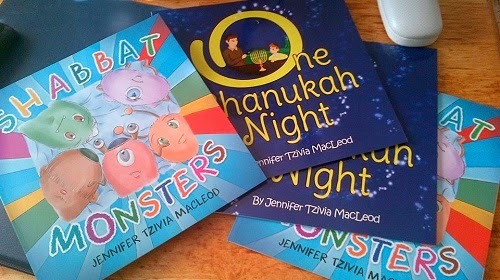 Proof copies: Shabbat Monsters and One Chanukah Night. If all I wrote about was me and my own books and how great I am, I know you probably wouldn't read my posts. But this blog is totally all about helping YOU write and publish great books. And sometimes, one of the ways I do that is by sharing my own experiences. So you'll know that I'm out here, too, struggling with rejection, trying my darndest to write great books and get them out into kids' hands... just like you are. So I wrote a story, a few months back. My 6-year-old son was feeling very sad and very excluded in his kindergarten. He didn't speak the language and the other kids, all growing up in the same neighbourhood, were very cliquey and exclusive. He came home one day, shortly after the kindergarten's "100th day" celebration and said it would be a hundred years before any of the kids would want to be his friend. A story for my son. So I ached for him, and wanted to write a story. A story... about monsters. Because he loves monsters. Who doesn't? The truth about celebrities… and their kids’ books. Should celebrities write children’s books? Whether we believe they should or not… that doesn’t seem to be stopping them. Does the fact that they are rich and famous give them greater insight to children’s literature than the rest of us? Peeking inside a few recent children’s books by celebrities, you can see that celebrity status doesn’t necessarily make for a talented or insightful writer… but it also doesn’t mean they’re not. This middle grade book, along with several others by the football-playing, kids’-book-writing brothers, is a great example of an encouraging children’s story by a celebrity, or in this case two celebrities. 10 success tips your writing teacher never told you (but Jeff Gunhus will). Quick: what’s the opposite of success? You guess it – f… f… f…. Oh, shoot. I can’t bring myself to say it. And neither should you. We may be lying in the gutter, as they say, but we can still lie back and stare up at the stars. If you want to get inspired, and actually create books that find readers, your best bet is to listen to people who are already successful. Especially if they’re Jeff Gunhus, who’s made his own success in self-publishing. Jeff had the best motivation of all to create his Jack Templar series of kids’ books. But the truth is, he was already a successfully conventionally-published writer before he set out to publish his own kids’ books. That makes him twice as much of an authority, as far as I’m concerned. 1) Write a lot. Every day. Without fail. Even for ten minutes. It's easier to push a car that's already moving instead of one at a full stop. 2) Read a lot. "I don't have time to read," means you don't care enough to be a good writer. Create a book list for yourself and set goals. 3) Create fertilizer. The first draft is the pile of manure out of which great things will come. Allow yourself to make a pile of dung. It's going to be fine, just keep going. How are your books selling? A $5 book that can turn sales around. Do you have a head for business? If you’re a writer, of any kind, your business – like it or not – is writing. And the best guide I’ve seen so far to building a writing business is a hefty tome (479 pages) with the hefty title Write. Publish. Repeat. (The No-Luck-Required Guide to Self-Publishing Success). With a thousand-dollar title like that, you’d expect to pay maybe $17 for this gem, but I just checked and the current Kindle price is $5.58. Sometimes, as self-publishing children’s writers, we figure we’re somehow exempt from all the messy business-type stuff that applies to other self-pubbed writers today. As a self-publishing (or, as they say, indie) writer, you have to keep your head on your shoulders and focus on the 80% of activities that pull in the vast majority of profits. Don’t worry; writing is one of them. Stuff like piddling around with facebook and blogs (oops) might not be. Everyone knows writers write. Right? But since I became an Orthodox Jew a looooong time ago, writing hasn't been an option at least one day out of every week. From sundown Friday to sundown Saturday, and on holidays, I don’t write, either with a pen or computer. Please don’t underestimate how hard this is. It’s CRAZY hard. And it’s never gotten easier, the longer I’ve done it. Need inspiration? 15 wild quotes about children and reading, from Maya Angelou and more. Some of these may make you smile, some of these may make you laugh, or stop and think. I hope they will all inspire you to keep doing what you’re doing. Basics, Part 3: Are you choosing words that zoom, screech, soar, sing? And writing is all about words? So picking the words to go into your kids’ book should be simple… but it’s not. In Basics, Part 2: Does your book measure up?, we looked at the first part of that definition: pages between covers. How many pages, exactly? How many words? Well, that depends on who you’re writing for. And so does the language you choose to fill your book. You want to choose words that zoom; words that soar; words that transport your readers and sing to them – or screech at them. In Part 2, I actually gave you a chart, and I’m going to do the same thing here. Let me be honest: a lot of people HATED the chart in my last Basics post. These folks are artists, and I respect that. And they refuse to be hemmed in by conventions. Fair enough. But if you were an artist artist, I mean the kind that paints pictures, and somebody hired you to paint a family portrait to hang on the wall above their fireplace… would you measure the wall above their fireplace first? And then you’d choose a canvas to fit the space, right? Here’s what you wouldn’t do: go home, picking up any old size of bedsheet along the way; and proceed to paint the picture on a canvas that was huge… or too tiny to be seen. If you do, I would hope you’d have the good grace not to get made at your client if he refused to pay for your work. As most painters through the ages have discovered, working within size (and other) constraints probably won’t kill your artistic spirit. So please don’t hate me for suggesting them. Our family is Jewish, and I’ve written about writing Jewish children’s books a few times before. I thought it would be both fun and fair to my non-Jewish readers to offer a bit of breadth and invite a friend to talk about her approach to writing Christian children’s literature. Polls show that more than 90% of Americans believe in God. They may not all be deeply devout, but many are, and that means hundreds of thousands of parents looking for books that reflect their own family’s values. This is a major market. I’m not deeply sad that I don’t get a slice of this pie, but I’m happy to be able to share her tips to help you reach these families, if that’s part of your writing goal. With these 5 tips, I hoped to help you turn out books that are Christian without the “cringe” factor. But then I read her post, and realized it wasn’t just for Christian writers. The rest of us need to read this, too. A guest-post I just had to share. To make your book amazing shakes. And leave your comments thereabout. 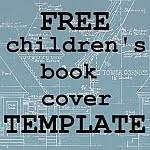 I’ve loved Joel Friedlander’s Book Designer blog and have wanted to guest-post there for a while… so I did, with this post, 5 People You Need on Your Team When You’re Self-publishing a Kids’ Book. Hope you’ll stop by over there to check it out. Sorry, but that’s what comes to my mind when I think of Eric Kimmel. Creepy, as in the very best kind of creepy Jewish books: ghosts, ghouls, goblins and all things paranormal. Hershel and the Hanukkah Goblins kind of creepy. Gershon’s Monster kind of creepy. Jack and the Giant Barbecue kind of creepy. Huh? Jack and the… giant… barbecue? 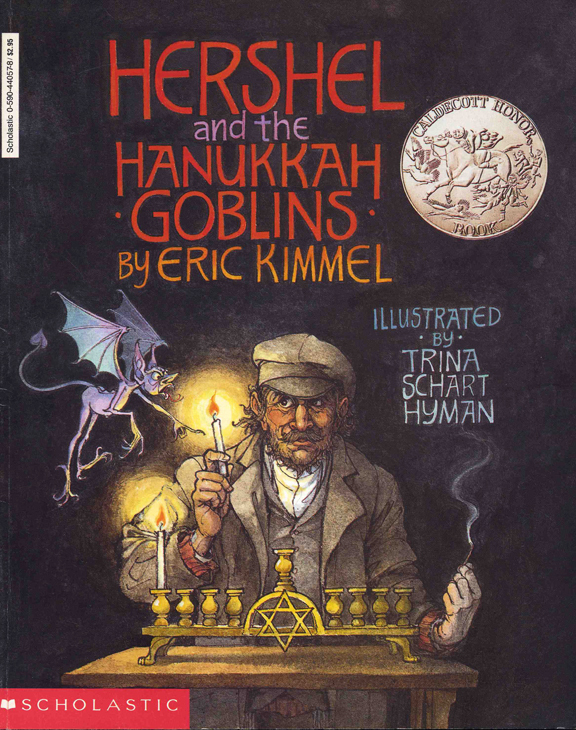 Sure, Eric is the undisputed champion of creepy Jewish kidlit, but if that sounds like he’s stuck in a niche, think again. He’s not just about creepy… or just about Jewish books, as you’ll see.